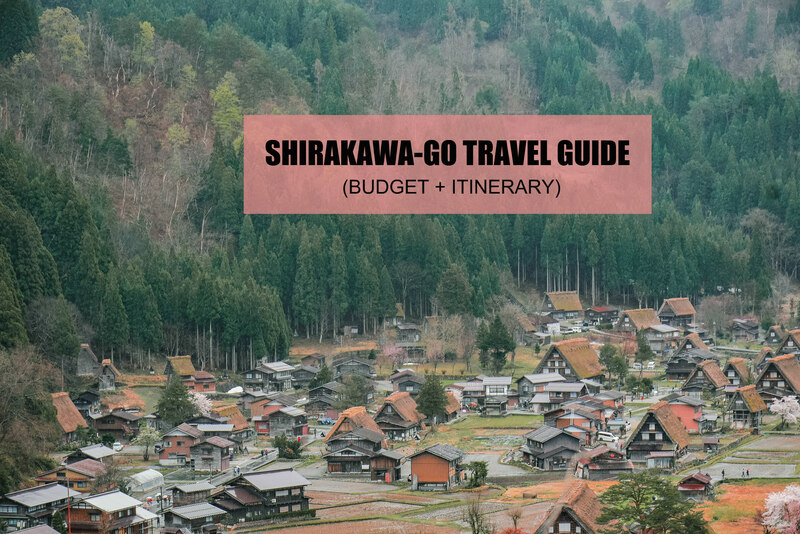 Here’s a detailed Shirakawa-go itinerary + travel guide blog with budget breakdown. Rightfully famous for its Gassho-style houses, Shirakawa-go has scenery rich in contrasting colors and real character. 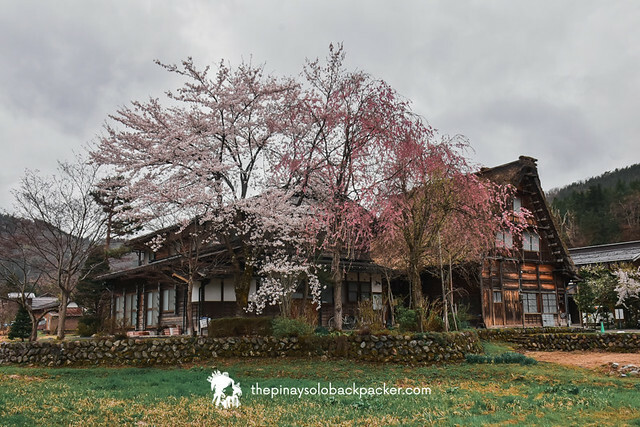 It was spring when we visited, cherry blossoms sprinkled around the farmland and the soaring tree-studded mountains blanketed by morning fogs add up to its dramatic landscape. 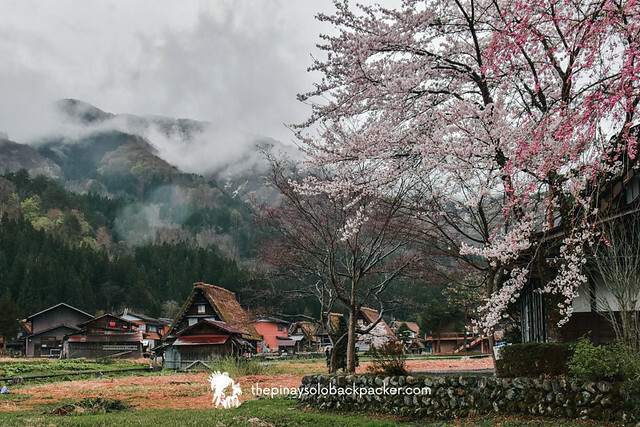 Shirakawa-go village in Gifu, Japan has held onto its old-fashioned traditions, appearance, and character, making it a UNESCO World Heritage Site. The most distinct feature of a Gassho-style house in this Shirakawa-go village is the roof, which resembles 2 hands in prayers. This style of roof makes the houses here well-suited for its weather – the heavy snowfall during winter and the humid weather during summer. The roofs face the west and east to get sunlight that also helps in melting the snow rapidly and drying the roofs, this is also why the Gassho-style houses here are facing the same direction, to prevent the houses from being knocked down by the wind blowing from the Sho-river. 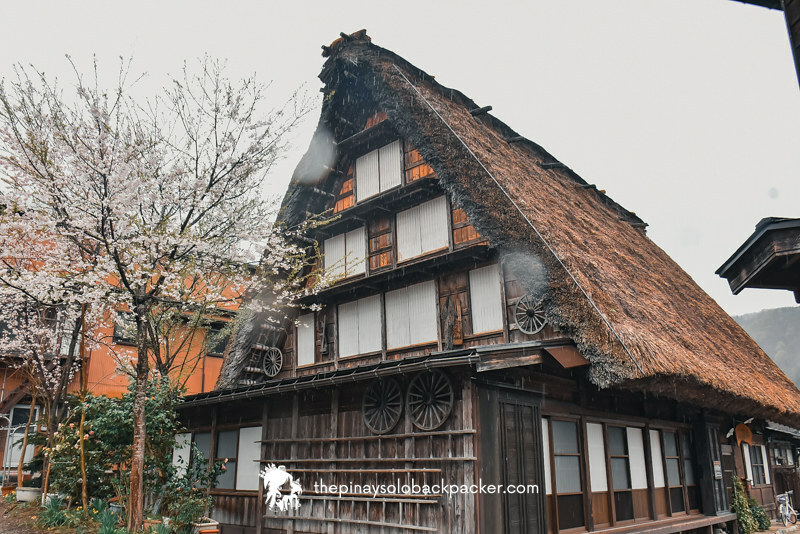 Also, since the attic of the Gassho-style houses in Shirakawa-go are usually used for sericulture, an alternative source of income for the locals, the sunshine and wind help in growing the silkworms. Interestingly, the construction of the thatched roof requires Yui – the villagers who volunteer to help build the roof. The roof must be completed in one day. Once it is completed, the Yui eat dinner together to celebrate. 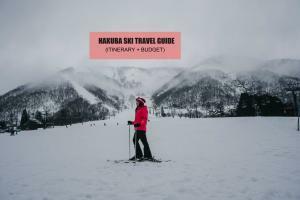 Here’s a Shirakawa-go travel guide with itinerary and budget to help you plan your visit here. Winter: The best time to visit Shirakawa-go is winter, which falls on December to January. During this season, the village peppered with Gassho-style houses that turns into a winter wonderland. The winter illumination is also held every night during winter. 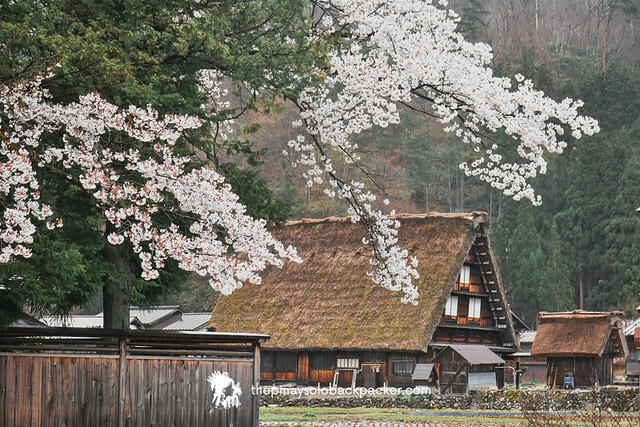 Spring : One of the best times to visit Shirakawa-go is during spring – March to May. 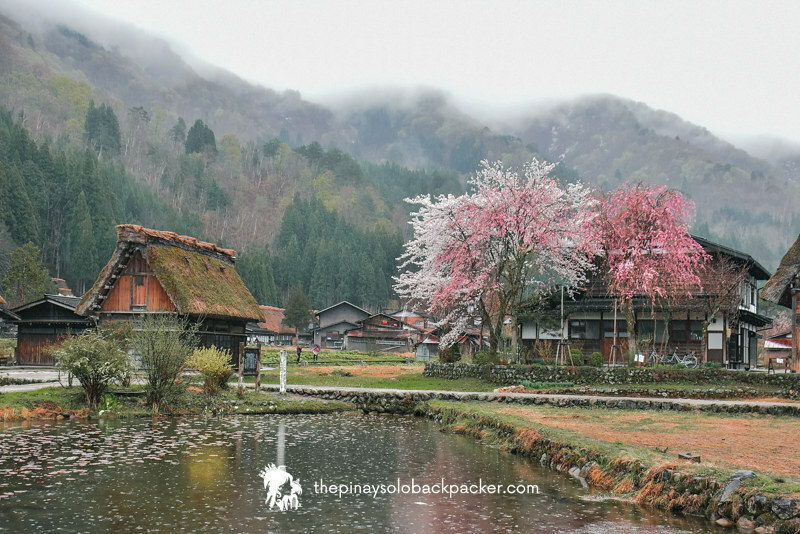 During this season, the village is sprinkled with cherry blossoms. You may even catch the snow-peaked mountains in the early weeks of spring. Autumn: For many tourists, autumn in Shirakawa-go is also a best time to visit. This season lasts from September to November. Shirakawa-go turns into a colorful village as the leaves of the trees turns into red, orange, and yellow. Summer: June to August is summer in Shirakawa-go. The village turns green and flowers starts blooming. JAPAN VISA: Philippine Passport holders are required to have a Japan visa to travel to Japan. Click here: JAPAN VISA REQUIREMENTS AND APPLICATION PROCESS. JAPAN TIME ZONE: Japan time zone is GMT+9,it is 1 hour ahead of Philippines. SHIRAKAWA-GO CURRENCY AND MONEY EXCHANGE: As in the rest of Japan, Japanese Yen is the currency here. Load up cash (Japanese Yen) before visiting Shirakawa-go as there are limited ATMs here. Also, most restaurants and shops only accepts Japanese yen cash. For money exchange, there’s a money exchange machine at Smart Exchange near the Shirakawa-go Bus terminal. Open from 8:30 AM to 5:30 PM. SHIRAKAWA-GO MODE OF PAYMENT: Most of the establishments here accepts Japanese yen cash, so stack up cash before visiting. SHIRAKAWA-GO ELECTRICITY: Like the rest of Japan, the electrical socket used in Shirakawa-go is type A and type B. Best to bring a universal adapter. The standard voltage is 100 V and the standard frequency is 50/60 Hz. SHIRAKAWA-GO WI-FI AND SIMCARD: There’s a “SHIRAKAWA-Go Free Wi-Fi” at different locations in Shirakawa-go. However, if you are traveling beyond Shirakawa-go, best to purchase a local sim card or rent a pocket Wi-Fi. If coming from the Philippines, there are regular flights from Manila to Nagoya (Chubu International Airport) and JETSTAR airline offers the cheapest rate I’ve seen so far. You can book your flights at Jetstar.com. Jetstar flies 4 times weekly from Manila to Nagoya, they offer one of the cheapest airfare to Japan. 1.Make your way to Centrair Japan International Airport Station. 3. Alight at Meitetsu Nagoya. If you only have a limited time in Nagoya to do the Shirakawa-go trip, best to just join a group tour. The tour already includes guide, plus a visit to Takayama. 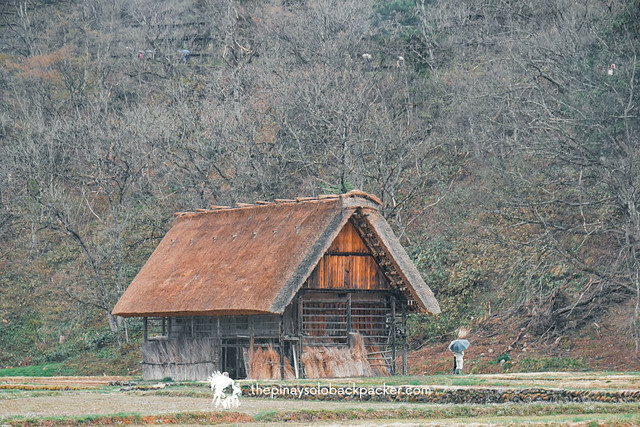 Takayama + Shirakawa-go Day Tour from Nagoya: RESERVE HERE. If you prefer a DIY Travel to Shirakawa-go, you can follow the steps below. However, to save on the bus fare, I recommend using the Shoryudo Highway Bus Pass. Even if you don’t intend to stay in this region for 3 days, the pass is still worth it because it includes a transfer to or from Chubu Airport. 1.Make your way to Nagoya Station. 2. Walk to Meitetsu Bus Center. This bus station is located at the Men’s building of the Meitetsu Department Store on the 3rd and 4th floor, it is next door to the main building of the Meitetsu Department Store. It should take about 5 minutes on foot. For directions, refer to Google Maps. You can take the escalator next to the giant Nana-chan mannequin statue to the entrance of Meitetsu Bus Center. Line, fare is JPY 3,900. It is highly recommended to book in advance as Shirakawa-go is a pretty popular destination. You can reserve a month before by calling the Meitetsu Highway Bus Center Reservation at 052 582 0489, if International phone call contact +81 52582 0489. You can also BOOK SHORYUDO HIGHWAY BUS PASS HERE. It’s way cheaper! This will save you 35% from your travels around Takayama, Shirakawa-go, and Kanazawa. And you can also use this for a 1 way train trip using Meitetsu Line between Nagoya Station and Chubu Airport. You can choose between a 3-5 day pass starting at ¥3,334 (₱1,584). *Important: Going back, make sure you don’t miss the last bus. Board your bus to Shirakawa-go. There are 8 boarding points in Meitetsu Bus Center. Buses to Shirakawa-go are usually parked at Boarding Point 7. Check your bus ticket or ask the staff. Show your ticket to the driver before boarding the bus. Travel time to Shirakawa-go is about 3 hours. Alight at the Shirakawa-go Bus Terminal. Make your way to Shiroyama Viewpoint. From the bus stop, you can walk for about 20 minutes to the popular Shiroyama Viewpoint that offers a scenic view of Ogimachi Village. Alternatively, you can also hop on a shuttle that can take you to the viewpoint for ¥200 (₱95). 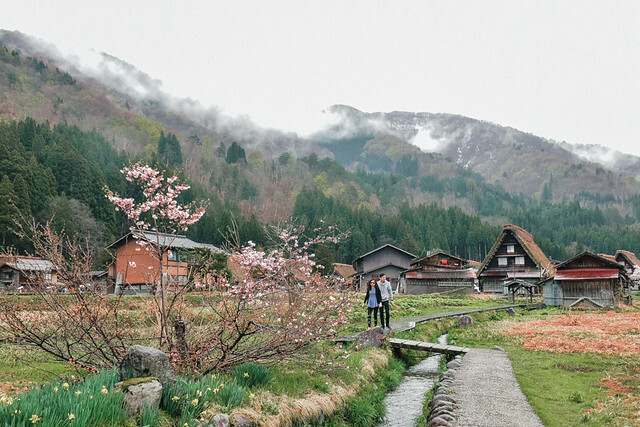 Make your way down to Ogimachi Village in Shirakawa-go. It will take about 20 minutes on foot or ride the shuttle bus going down for ¥200 (₱95). Explore Shiraka-wago on foot. Visit the Wada House, the Heritage Museum, craft and souvenir shops, the Deai-Bashi Suspension Bridge, etc. If you are coming from Takayama, follow the directions below. 1.Head to Nohi Bus Center. 2.Take the Nohi Bus on the Shirakawa-go/Kanaza Line. Fare is ¥2,470 (₱1,173). If you have a Shoryodu Highway Bus Pass (RESERVE HERE), you can use it here. 3.Get off at the Shirakawa-go Bus Stop (Ogimachi). Here’s the Nohi bus schedule from Takayama to Shirakawa-go. Those with *R means reservation is required. If you have a Shoryudo Highyway Bus Pass, you can call Nohi Bus Center to reserve your set. Or just go for the bus schedule without required reservation. 1.Go to Bus Stop #2 of Kanazawa Station at East Gate Terminal. 2. Take the Hokutetsu Bus to Shirakawa-go. Travel time is about 1 hour and 20 minutes. Fare is ¥1,850 (₱879) one-way. Roundtrip fare is ¥3,290 (₱1,563). 3.Alight at Shirakawa-go Bus Stop. For a detailed guide on how to travel from Osaka, Kyoto, or Tokyo to Shirakawa-go,READ HERE. The largest village and the main tourist attraction of Shirakawa-go village is the Ogimachi Village, peppered with Gassho-style houses. The best way to get around Shirakawa-go is by walking, since the Shirakawa Highway is closed to vehicles from 9:00 AM to 4:00 PM. Shirakawa-go Bus Stop (Ogimachi Bus Stop). If you are taking the public bus, you will get off here. Seseragi Park. If you are on board a tourist bus or private vehicle, you will park here. It I located near the Main Information Center and the Deai-bashi Suspension Bridge. TIP: Best to get a map first from the Information Center or refer to Google Maps for help in exploring the village. Here’s the approximate time to reach the following attractions on foot from the Shirakawa-go Bus Stop and Seseragi Park. First trip is 9:00 AM, last trip 3:40 PM, departs every :00, :20, and :40 of the hour. First trip is 9:10 AM, last trip is 04:10 PM, departs every :10, :30, and :50 of the hour. 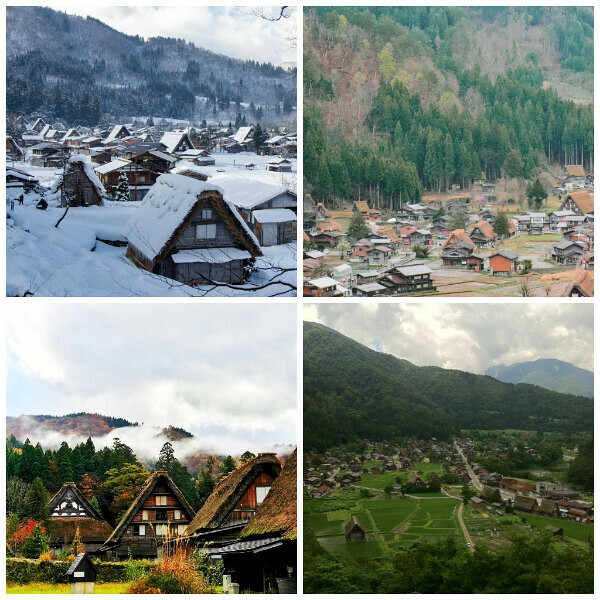 The picturesque photos of Gassho style houses in Shirakawa-go that you see online were most likely taken at Shiroyama Viewpoint. This viewing deck located near the parking lot offers a stunning view of Ogimachi village cut by a river where most Gassho style houses are concentrated. The biggest Gassho style house in Shirakawa-go to date. This place is owned by the prominent Wada Family and is open to the public. The first floor has a total of 8 rooms, and the ambience here is reminiscent of the ancient Japanese way of life. The official documents of the Wada House shows that it was home to an official who dealt with silk. In fact, if you climb the 2nd floor of the house, you will encounter tools and materials used for silk production. This Gassho style house turned museum was designated as an Important National Asset in 1971. This massive traditional house also houses equipment used for sericulture (silk farming). The place to be if you want to learn about the Doburoku Festival. You can also taste a doburoku sake here for free. The historic villages of Ainokura and Suganuma in Gokayama are also UNESCO World Heritage Sites. If you want to visit it in a day together with Shirakawa-go, you may book a day tour below. Another great side trip when visiting Shirakawa-go is Takayama, a well-preserved city with Edo-style streets. It can be done as a side trip when visiting Shirakawa-go. 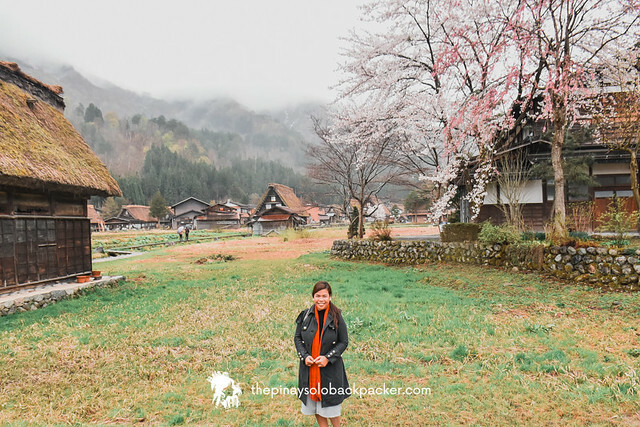 You can check out my detailed Shirakawa-go and Takayama itinerary below, or you can book a Takayama and Shirakawa-go day tour from Nagoya below. While a couple of Gassho-style houses turned hotels in Shirakawa-go are available, they come with a hefty price tag. But don’t fret because there’s a handful of budget guesthouses in the village to. See list below. If you only have a limited time, it is possible to do a Shirakawa-go day tour from Nagoya. I also listed below some Nagoya budget hotels if you like to stay in the city center. 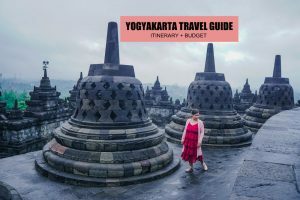 If you are just doing a day tour to Shirakawa-go from Nagoya and don’t plan on exploring other villages and town nearby, here are some of the budget hotels in Nagoya. We had lunch at Irori, a traditional Japanese sunken hearth. 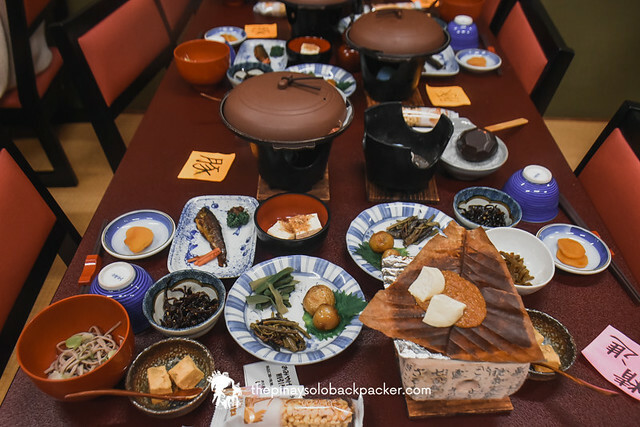 I really enjoyed the traditional home-made food here, which was prepared using a traditional cooking method of the Hida people. It is super delicious because it uses fresh vegetables and edible wild plants. Try the Hida beef pottery baked food, the Ichirari set meal set with stone cucumber as ingredients or the Hinada Miso set menu. This is another popular restaurant in Shirakawa-go because it is set in a 250 year-old Gassho style house with a view of the Shogawa River. Try their specialty food – the Hidagyi croquette and Doburoki (unfiltered rice wine) pudding. 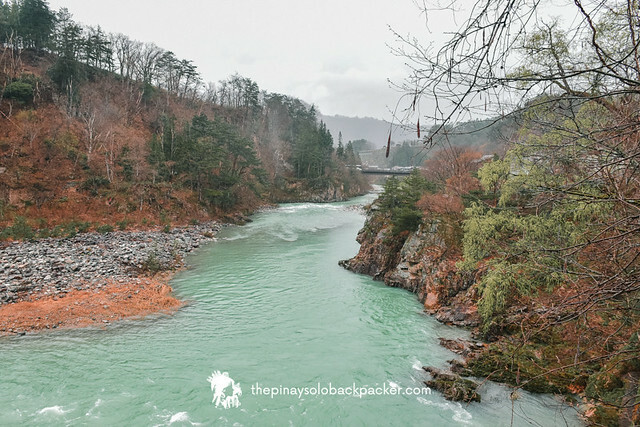 This DIY Shirakawa-go itinerary is good for 1 Day and if your hotel is in Nagoya. TRAVEL TIP: Best to use the Shoryudo Bus Pass to save on the cost of transportation even if you will be using it for 1 day only, the 3 day Pass for ¥3,334 (₱1,584) is still cheaper than the regular roundtrip bus fare for ¥3,900 (₱1,853) x 2= ¥7,800 (₱3,706). Walk or ride MTR to Nagoya Station. Walk to Meitetsu Bus Center at Men’s building of the Meitetsu Department Store on the 3rd and 4th floor. ETA Shirakawa-go Bus Stop at Ogimachi Village. Walk (20 mins) or take shuttle bus to Shiroyama Viewpoint (10 mins) for ¥200 (₱95). 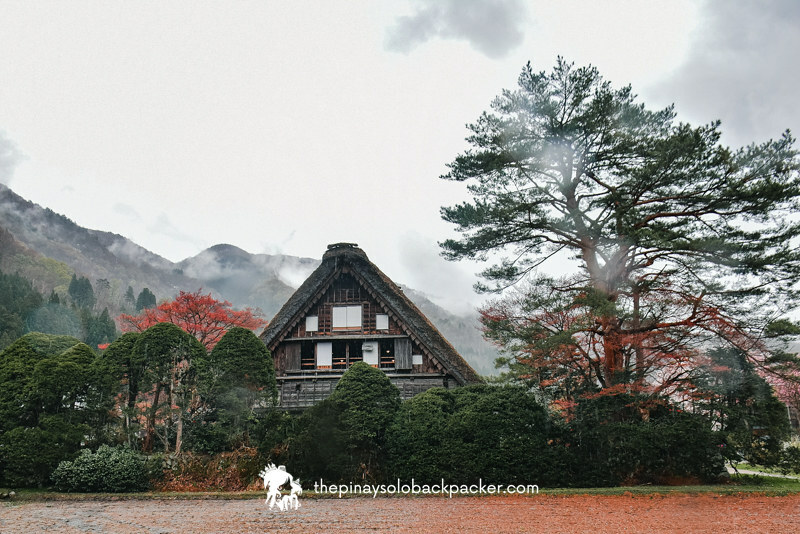 Walk or shuttle bus to Ogimachi Village for JPY 200 (₱95). ETA Meitetsu Bus Center in Nagoya. *If you are using a Shoryudo Bus Pass, your estimated expenses for 1 Day if you follow the above Shirakawa-go itinerary is ¥5,654 (₱2,686). This is the sample Takayama + Shirakawa-go itinerary if you join a group tour. RESERVE HERE . 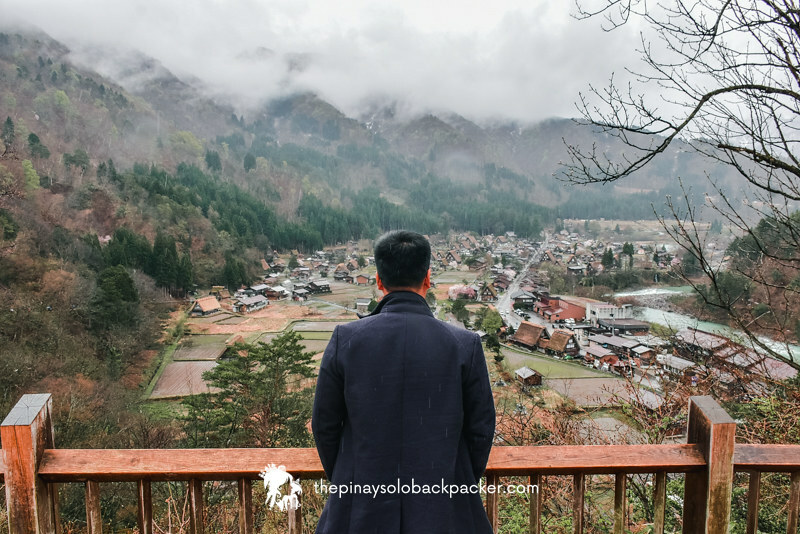 Here’s a sample DIY Shirakawa-go itinerary including a side trip to Takayama. TRAVEL TIP: It’s best to use a Shoryudo Bus Pass if you plan on doing this so you can save. Only ¥3,334 for unlimited rides for 3 days within Nagoya, Shirakawa-go, Takayama, and Kanazawa. Walk (20 mins) or take shuttle bus to Shiroyama Viewpoint (10 mins) for ¥200(₱95). Walk or shuttle bus down to Ogimachi Village for ¥200 (₱95). 1.From Nagoya Station, take the subway to Sakae Station. 2.Change subway for Nagoya Dome Mae Yada. 4. Exit station. Walk for about 3 minutes to the castle gate. 1.From Shiyakusho Station, take subway to Nagoyako. 3. Change subway to Sako Station. 4.Get off at Sako Station. 5.Walk for about 3 minutes to Toyota Commemorative Museum. Depart to Chubu Airport or next destination. *Hotel, souvenirs, drinks, and snacks not included in the sample budget above. There are lockers at Shirakawa-go Bus Stop. Fee is JPY 500. But in case it’s already full, you can leave your bags at the manned counter at another building, a few meters away from the bus station. Fee is ¥800 (₱380). Stack up cash before visiting Shirakawa-go as most restaurants, shops, and guesthouse only accepts yen cash payments. There’s limited ATM in this village and ATM only works during business hours on business days. Don’t enter a private property, do not peer into houses, or open doors or windows without permission. Always ask permission if you want to take a photo of the house interior. Do not pick plants, flowers and herbs. Avoid bringing flammable materials as the houses in Shirakawa-go village are built from flammable traditional materials. Bring a flashlight if you will be walking at night. Using drone in Shirakawa-go is frowned upon, as the village is a residential area. In Japan, you show appreciation by eating everything.